The 4 Swimming pool cottages have 2-3 bedrooms and are semi-detached. Two of them have a private garden at the back! 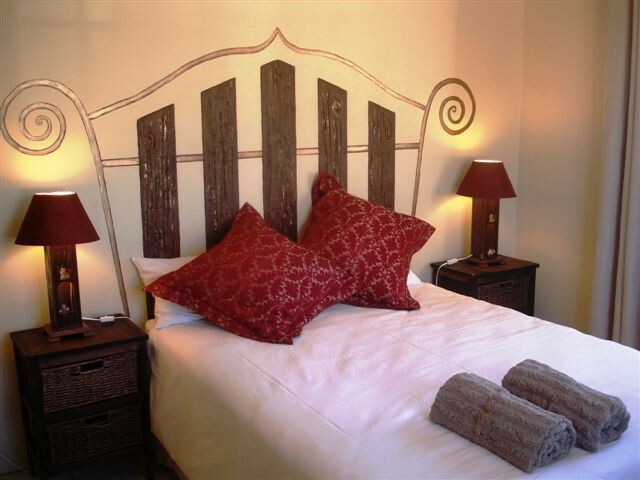 The Olive Tree Cottage is situated in the farm yard, 75m away from the 4 swimming pool cottages. It is our more luxurious cottage with one spacious bedroom, a bathroom and an open plan kitchen/dining room area. Ideal for a peaceful breakaway! The Farm House in the orchards is surrounded by a stone wall and has 4 bedrooms and 4 bathrooms. It is ideal for a larger family or circle of friends. The Hillside cottage is a two bedroom cottage in the fields, 2km away from the yard. The Ideal place to be on your own, away from everything and everyone!! We supply bedding, towels, dishcloths & dishwashing liquid, toilet paper and braai grid. We also supply wood and extra wood is sold at R15 per box. Please bring your own swimming towels, braai tongs, mosquito repellent for outside and two prong plugs for your cell phones! Directions from Montagu : on the R62, 8.2km from Montagu on the way to Barrydale, turn left at Rietvlei No 1. Follow the Rietvlei sign for 2.4km on the gravel road and stop at the swimmingpool - we will meet you there! The cost for our Swimming pool cottages is R220 pppn and R80 per child between 3 en 18 years. Our Farm House, Hillside & Olive Tree cottage rates are R240 pppn and R80 per child between 3 and 18 years.